While somewhat limited, facilities at Cozumel International Airport are ample for an airport of its size and passenger throughput. Passengers using the airport will find bank and bureau de change facilities as well as a reasonable selection of shopping outlets and other retailers dedicated to providing food and refreshments. An information desk is on hand to assist passengers, while a medical centre is open 24 hours for passengers requiring medical aid. An information point is available in the main concourse area, which can provide passengers with details about the airport and the island of Cozumel. Besides the customary duty-free outlet which is available beyond security, the airport has a small selection of shops which include Carlos and Charlie's Store, Pineda Covalin, Sunglass Island, Hard Rock Store, Los Cinco Soles, Bijou Terner and a newsagent and an aeroboutique. A food court offers Grab and Go, at which a variety of snacks and light meals are available, while the nearby Kahlua Café sells hot and cold drinks and snacks. The Colombian Coffee Shop is also on hand for beverages. Banking and bureau de change facilities are provided by American Express and BANAMEX. Public telephones are available throughout the airport. There are no business or conference facilities available at the airport. 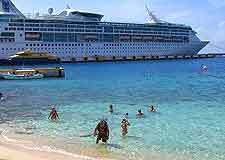 However, passengers requiring business facilities should head to the Presidente InterContinental Cozumel Resort and Spa, which is situated nearby the airport and has significant business and conference facilities. Standard facilities are available for passengers with special needs including ramps for wheelchairs and disabled-friendly toilets. Passengers requiring extra assistance should contact their airline before arriving at the airport. A 24-hour medical centre is available to assist passengers with medical needs.